Alex Cull kicks off the 405's Resident Evil retrospective. Each week, one of our games writers will be sharing their experiences playing Capcom's seminal survival horror series, as we build up to the release of Resident Evil 6. 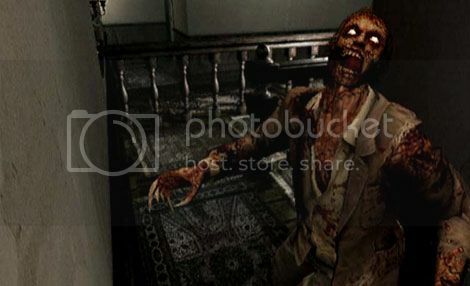 For all the boundless advances the Resident Evil series has made in recent years with its fourth, fifth, and now sixth iterations, you’d have to possess a heart of stone to deny the sheer power of the moment you first encounter a zombie in 2002’s remake. It was the moment that survival horror entered a new era of gore, gloriously graphic and now vividly engrained on a generation of gaming minds. Sure, by this point you’re about ten minutes into the game, and you’ve already witnessed the blood-riddled intro placing you stranded in an eerie, isolated mansion, but things don’t really hit home until that first zombie is shambling towards you. You should’ve seen it coming. There were numerous warnings. From the initial disclaimer of ‘this game contains scenes of explicit violence and gore’, to the body bag that springs to life before you’ve even reached the title screen. But you just didn’t listen and now it’s come to this. Your fledgling curiosity has led you here, as you look into the eyes of something once very much human but far from it now. It slowly rises from the rotting sinews it had been feasting on and lunges towards you with a hollow expression, a killer’s expression; cold, remorseless, dead. This is all your fault. Then, it happens. You discover the B button and within seconds you’re unloading shell after shell into this creature’s rotting flesh, but it does no good and you must retreat to your teammate. It’s a stirring turn of events, and one that leaves the nascent player with a feeling of incomparable helplessness – one that many had not felt since they were chased through the streets of Raccoon City by a seemingly un-killable Nemesis… And this was a mere zombie. This is but the first of many twists and turns designed by horror connoisseur Shinji Mikami to uproot the series and take it somewhere decidedly more dark, more unexpected and more innovative than its previous Playstation outings. In short, you’re not in Kansas anymore, kids, and no amount of cheesy dialogue, live-action intros or hammy voice acting will save you this time. As things progress, the tension only gets worse. Enter a room and nothing happens, but re-enter it from a different doorway and suddenly countless undead dogs crash through the windows, leaping at you in the blink of an eye. Flick the wrong light switch in a gallery and ravenous crows burst out and attack you – definitely the worst avian attack since Hitchcock’s The Birds. But the worst is yet to come. Just as you’re beginning to feel the slightest bit adept in your mansion surroundings and you believe that no zombie or other creature crashing through a door or window can make you so much as flinch, it happens. You’re proudly strutting past yet another deceased corpse that you and your trusty handgun have sent back to hell when, impossibly, it rises. Almost hissing at you, it doesn’t shamble, but runs your way, slashing for you with fierce talon-like fingernails. Ladies, gentlemen, esteemed S.T.A.R.S members; I give you the Crimson Head: the double dead, twice as fast and immensely more powerful zombie mk.2 of Resident Evil. That this would be the only title in the series in which they appear is a travesty, because these guys had game. Now, things are really getting heated. The enemies are coming in thick and fast. Following the Crimson Heads in suit are Hunters, Chimeras, giant snakes, spiders and sharks; it’s nigh on impossible to stray far at all in this hellhole without encountering some new cause for terror, yet another cooling drip of sweat slyly slipping down the back of your neck. But, without the right ambiance, we’re seriously at risk of this turning into a monster fest with no brains, right? Well, Capcom have got you covered. Gone are the series’ past entries’ reliance on blocky graphics, unflattering lighting and blood so fake it would make Tom Savini squirm. In their place are gorgeous pre-rendered backdrops, a score that’s memorable and unsettling in equal measure, and enough ultra-violence to render A Clockwork Orange timid by comparison. 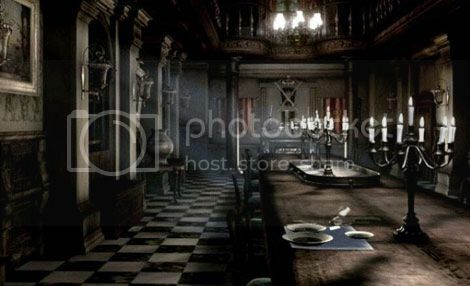 You can’t take a stroll around the mansion or its surrounding grounds and laboratories without noticing the little things; a candle flickering serenely in the midnight breeze, a roast dinner – or corpse, for that matter – left half-eaten, the long shadow cast by a zombie as it watches you through a window in the moonlight. It’s the breathtaking attention to detail that makes Resident Evil such an immersive experience, particularly on that first, unnerving play. And completing it that first time sure is an accomplishment. The myriad of cunningly deceptive – and at times honestly illogical – puzzles sees to that. These challenges of the mind would be hard enough to conquer under any circumstances, let alone when you’re mere seconds away from being devoured whole by a freakishly large man-eating shark or facing a countdown to the imminent explosion of the entire mansion grounds. In the end though, whether you get a good ending or not – yes, that’s right, there are multiple endings too – you’ll be relieved to see your helicopter disappear off into the sunrise, but a little piece of you will always stay in the mansion; frightened, alone, alive. While pundits give the critical and influential nod to Resident Evil 4, the importance of the first leaps made into a new era of survival horror here should not be forgotten. Each crisply portrayed headshot and every startlingly smashed window is the stuff of legend. Enter at your own risk but don’t say I didn’t warn you.